William Roper was born on 18 December 1839 at Germany. He married Dorothea Schearwater circa 1866. William Roper died on 29 September 1922 at Reedsburg, Sauk, Wisconsin, at age 82. [S245] U.S. Federal Census 1900 U.S. Federal Census, by Ancestry.com, ED142. Dwelling 410. Name Variation Dorothea Schearwater was also known as Dora. Married Name circa 1866 As of circa 1866,her married name was Roper. Dorothea Schearwater was born on 27 March 1843 at Germany also reported as Mar 1844. She married William Roper circa 1866. Dorothea Schearwater died on 31 August 1915 at age 72. Dorothea Schearwater had 7 with 6 living in 1900 children. John Dietrich Rosenthal was born on 10 March 1859 at Milwaukee, Wisconsin, also reported as July 1859. He was the son of Charles L. Rosenthal and Dorathea Schweke. John Dietrich Rosenthal married Ida Marie Louise Collis, daughter of August Ferdinand Collies and Pauline Reiker, on 17 December 1886 at Reedsburg, Sauk, Wisconsin. John Dietrich Rosenthal was listed as a beneficiary in Charles L. Rosenthal's will on 3 June 1890 at Sauk, Wisconsin. John Dietrich Rosenthal died on 10 March 1928 at age 69. [S248] U.S. Federal Census 1860 U.S. Federal Census, by Ancestry.com, Year: 1860; Census Place: Milwaukee Ward 6, Milwaukee, Wisconsin; Roll: M653_1423; Page: 589; Image: 199; Family History Library Film: 805423. [S247] U.S. Federal Census 1870 U.S. Federal Census, by Ancestry.com, Year: 1870; Census Place: Reedsburg, Sauk, Wisconsin; Roll: M593_1739; Page: 220B; Image: 448; Family History Library Film: 553238. [S246] U.S. Federal Census 1880 U.S. Federal Census, by Ancestry.com, NA Film Number T9-1446 Page Number 203A. William J. Rosenthal was born on 15 December 1888 at Ironton, Sauk, Wisconsin. He was the son of John Dietrich Rosenthal and Ida Marie Louise Collis. Carl Edward Rosenthal was born after 1889. Married Name 31 May 1922 As of 31 May 1922,her married name was Tilker. Hilda Anna Rosenthal was born on 26 May 1897 at Reedsburg, Sauk, Wisconsin. She was the daughter of John Dietrich Rosenthal and Ida Marie Louise Collis. Hilda Anna Rosenthal married Paul A. Tilker, son of Frederick W. Tilker and Anna Katherine Dorothea Winecke, on 31 May 1922. Hilda Anna Rosenthal died on 21 March 1955 at age 57. [S214] Wisconsin Sauk Co Cemetery Records Vol 9, page 147. William Rosenthal married Gladys Knowles. William Rosenthal was born on 6 December 1881 at Ironton, Sauk, Wisconsin, also reported as 06 Dec 1882. He was the son of Gustave Julius Rosenthal and Paulina Bertha Collies. William Rosenthal died on 16 February 1974 at age 92. [S214] Wisconsin Sauk Co Cemetery Records Vol 9, page 12. Name Variation Edith F. Rosenthal was also known as Ida. Married Name 28 June 1911 As of 28 June 1911,her married name was Wischoff. Edith F. Rosenthal was born on 6 March 1884 at Ironton, Sauk, Wisconsin. Edith F. Rosenthal married Herbert L. Wischoff, son of Herman Wischoff and Elizabeth Halbersleben, on 28 June 1911. Edith F. Rosenthal died on 13 November 1963 at age 79. Louis Rosenthal was born on 16 January 1889 at Ironton, Sauk, Wisconsin. Louis Rosenthal died before September 1985. Edward Rosenthal married Frieda P. Huebing. Edward Rosenthal was born on 15 September 1891 at Reedsburg, Sauk, Wisconsin. Edward Rosenthal died on 18 August 1969 at age 77. [S214] Wisconsin Sauk Co Cemetery Records Vol 9, page 150. Name Variation Leona Bertha Rosenthal was also known as Leone. Married Name 8 January 1920 As of 8 January 1920,her married name was Riggert. Leona Bertha Rosenthal was born on 29 August 1893 at LaValle, Sauk, Wisconsin. Leona Bertha Rosenthal married Herman R. Riggert, son of Hermann August Riggert and Louisa Elsa Darger, on 8 January 1920. Leona Bertha Rosenthal died on 1 September 1985 at age 92 Herman Rudolph Riggert, 90, died Tuesday, September 3, 1985 in a Crown Point Nursing Home following a long illness. He was born February 17, 1895 in Loganville to Herman and Louisa (Darger) Riggert. He had been employed by U.S. Steel as a steel worker. Leona Bertha Riggert, 92, died Sunday, September 1, 1985 in Merrillville, Indiana following a short illness. She was born August 29, 1893 in LaValle to Gustav and Paulina (Collies) Rosenthal. She had been a housewife most of her life. Herman and Leona were married January 8, 1920 in Reedsburg. They are survived by one daughter, Mrs. Ruth A. Klukas, Merrillville, IN; two grandsons; two great-grandsons; two step-great-granddaughters. Herman is also survived by one sister, Louise Riggert, Baraboo. Funeral services for Herman and Leona were held on Friday, September 6 at the Gant Funeral Home with Rev. Dennis Hipenbecker officiating. Burial was made in St. Peter's cemetery. Gant Funeral Home was in charge of arrangements. Taken from the Reedsburg Paper. [S214] Wisconsin Sauk Co Cemetery Records Vol 9, page 159. [S250] U.S. Federal Census 1930 U.S. Federal Census, by Ancestry.com, ED62. Dwelling 262. Arthur Rosenthal married Alwine Meyer. Arthur Rosenthal was born on 30 September 1896 at Reedsburg, Sauk, Wisconsin. Arthur Rosenthal died before September 1985. Name Variation Charles L. Rosenthal was also known as George. Name Variation Charles L. Rosenthal was also known as Carl. Charles L. Rosenthal was born on 23 December 1826 at Prussia. He was the son of (?) Rosenthal. Charles L. Rosenthal married Dorathea Schweke, daughter of Joahnn Friedrich Schweke and Anna Wilhelmine Thoms, on 25 April 1858. Charles L. Rosenthal died on 9 September 1888 at age 61. His estate was probated on 3 June 1890 at Sauk, Wisconsin. [S214] Wisconsin Sauk Co Cemetery Records Vol 9, page 103. Name Variation Dorathea Schweke was also known as Anna Dorothea. Name Variation Dorathea Schweke was also known as Theodora. Name Variation Dorathea Schweke was also known as Dora. Married Name 25 April 1858 As of 25 April 1858,her married name was Rosenthal. Dorathea Schweke was born on 12 June 1835 at Retzen, Hanover, Germany, also reported as Jun 1836. She was the daughter of Joahnn Friedrich Schweke and Anna Wilhelmine Thoms. Dorathea Schweke married Charles L. Rosenthal, son of (?) Rosenthal, on 25 April 1858. Dorathea Schweke was the executor of Charles L. Rosenthal's estate on 3 June 1890 at Sauk, Wisconsin. Dorathea Schweke died on 26 May 1904 at Milwaukee, Milwaukee, Wisconsin, at age 68. Dorathea Schweke had 7 with 6 living in 1900 children. [S245] U.S. Federal Census 1900 U.S. Federal Census, by Ancestry.com, Year: 1900; Census Place: Milwaukee Ward 19, Milwaukee, Wisconsin; Roll: T623; Page: 2A; Enumeration District: 166. Henry Rosenthal was born on 14 August 1864 at Milwaukee, Wisconsin. Henry Rosenthal died on 4 April 1889 at age 24. He was listed as a beneficiary in Charles L. Rosenthal's will on 3 June 1890 at Sauk, Wisconsin. Name Variation Friedrich Rosenthal was also known as Frederick. Friedrich Rosenthal was born on 23 May 1862 at Milwaukee, Wisconsin. Friedrich Rosenthal married Bertha Schwanz in 1889. Friedrich Rosenthal was listed as a beneficiary in Charles L. Rosenthal's will on 3 June 1890 at Sauk, Wisconsin. Friedrich Rosenthal died on 10 August 1928 at age 66. [S214] Wisconsin Sauk Co Cemetery Records Vol 9, page 136. August Rosenthal married Emma Hartig, daughter of Henry Hartig and Christina Luehrsen. August Rosenthal was born on 8 August 1867 at Reedsburg, Sauk, Wisconsin. August Rosenthal was listed as a beneficiary in Charles L. Rosenthal's will on 3 June 1890 at Sauk, Wisconsin. August Rosenthal witnessed the death of Dorathea Schweke on 26 May 1904 at Milwaukee, Milwaukee, Wisconsin. August Rosenthal died on 1 May 1944 at Wisconsin at age 76. William H. Rosenthal was born circa 1871 at Reedsburg, Sauk, Wisconsin. William H. Rosenthal married Laura Hartig, daughter of Henry Hartig and Christina Luehrsen, on 25 January 1889. William H. Rosenthal was listed as a beneficiary in Charles L. Rosenthal's will on 3 June 1890 at Sauk, Wisconsin. William H. Rosenthal died on 13 November 1940 at Sauk, Wisconsin. Gustav Rosenthal married Hilda Dargel, daughter of Fred Dargel. Gustav Rosenthal was born in March 1874 at Reedsburg, Sauk, Wisconsin. 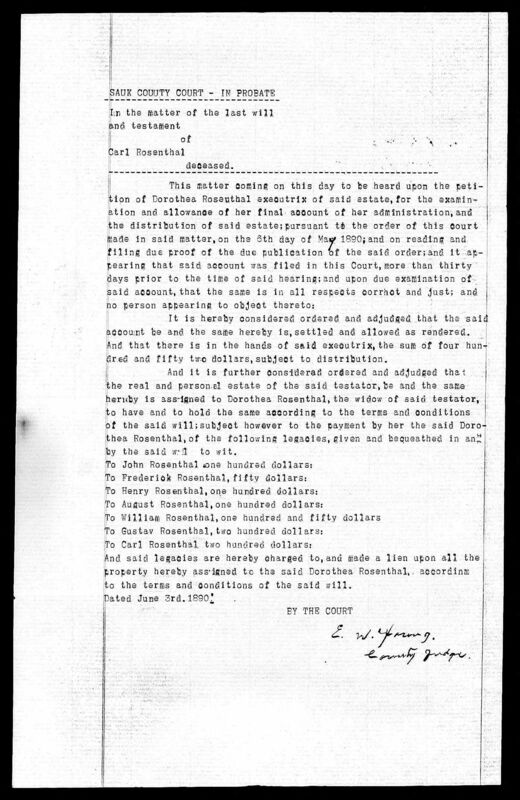 Gustav Rosenthal was listed as a beneficiary in Charles L. Rosenthal's will on 3 June 1890 at Sauk, Wisconsin. Gustav Rosenthal died on 21 August 1941 at Wisconsin at age 67. Name Variation Charles F. Rosenthal was also known as Carl F.
Charles F. Rosenthal was born in January 1877 at Reedsburg, Sauk, Wisconsin. 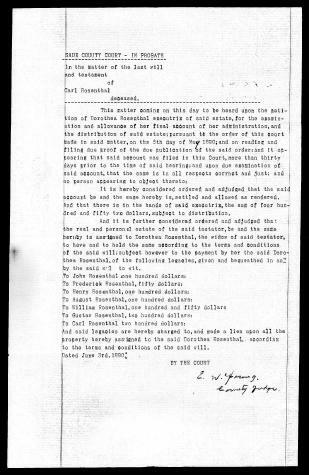 Charles F. Rosenthal was listed as a beneficiary in Charles L. Rosenthal's will on 3 June 1890 at Sauk, Wisconsin. Charles F. Rosenthal died on 26 December 1940 at Wisconsin at age 63. Paul A. Tilker was born on 29 August 1886 at Loganville, Sauk, Wisconsin. He was the son of Frederick W. Tilker and Anna Katherine Dorothea Winecke. Paul A. Tilker married Hilda Anna Rosenthal, daughter of John Dietrich Rosenthal and Ida Marie Louise Collis, on 31 May 1922. Paul A. Tilker died on 2 October 1949 at age 63. In 1929 PAUL TILKER, son of Fred and Dorothea (WINEKE) TILKER, was born Aug. 29, 1886, Loganville; married May 31, 1922, Hilda RESENTHAL, daughter of John and Ida (COLLICE) ROSENTHAL. She was born May 26, 1897. They have two children: Harriet, born May 15, 1923, and Dorothy, born Sept. 23, 1924. [S244] U.S. Federal Census 1910 U.S. Federal Census, by Ancestry.com, ED130. Dwelling 224. Married Name Her married name was Hettler. 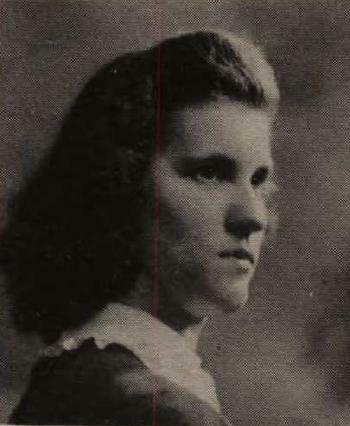 Harriet D. Tilker married Lynn Hettler. Harriet D. Tilker was born on 15 May 1923. She was the daughter of Paul A. Tilker and Hilda Anna Rosenthal. Harriet D. Tilker died on 31 July 2002 at age 79. Harriet D. Tilker obtained US Social Security Card at Wisconsin; last residence Milwaukee, Milwaukee, Wisconsin. She graduated in 1941 at Reedsburg High School, Reedsburg, Sauk, Wisconsin. Married Name Her married name was Petronia. Dorothy A. Tilker married (?) Petronia. Dorothy A. Tilker was born on 23 September 1924. Dorothy A. Tilker died on 24 September 2002 at age 78 Services were Monday for Dorothy A. Petronia, who died Sept. 24. She was 78. She was employed by J.I. Case Co. for many years. She was a member of the J.I. Case 20-Year Club and St. John's Lutheran Church, where she was active in the Mission Guild and the Half-century Club. Survivors include one brother-in-law, Lynn Hettler of Wauwatosa. The family has suggested memorials to St. John's Lutheran Church Altar Guild. The Purath-Strand Funeral Home, 3915 Douglas Ave., handled the arrangements. 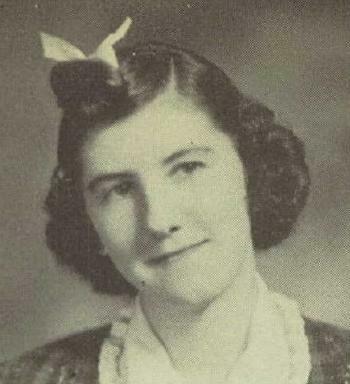 Dorothy A. Tilker graduated in 1942 at Reedsburg High School, Reedsburg, Sauk, Wisconsin. Fred Tilker was born circa 1928. He was the son of Paul A. Tilker and Hilda Anna Rosenthal. Fred Tilker died on 21 March 1928. Infant Tilker was born circa 1933. Infant Tilker died in 1933. Infant Tilker was the child of Paul A. Tilker and Hilda Anna Rosenthal. Fred Rosenthal was born on 5 October 1878. Fred Rosenthal died on 8 March 1879. [S214] Wisconsin Sauk Co Cemetery Records Vol 9, page 117. Married Name 1889 As of 1889,her married name was Rosenthal. Bertha Schwanz was born in 1867. She married Friedrich Rosenthal, son of Charles L. Rosenthal and Dorathea Schweke, in 1889. Bertha Schwanz died on 30 December 1955. Emma Rosenthal was born in 1880. She was the daughter of Friedrich Rosenthal and Bertha Schwanz. Emma Rosenthal died on 20 May 1932 Miss Emma Rosenthal, former resident of Reedsburg, died Thursday night at a Fond du Lac hospital shortly after an operation. The funeral was held in Reedsburg Sunday afternoon at the St. Peter’s Lutheran church. It was conducted by the Rev. Carl Schimmerer. Survivors are her mother, Mrs. Fred Rosenthal; her sister, Mrs. Arthur Thayer, Baraboo, and two brothers, Ewald Rosenthal, Reedsburg, and Reinhold Rosenthal, Columbus. Wisconsin State Journal, May 25, 1932. Married Name Her married name was Rosenthal. Alwine Meyer married Arthur Rosenthal, son of Gustave Julius Rosenthal and Paulina Bertha Collies. Gordon W. Rosenthal was born in 1929. He was the son of Arthur Rosenthal and Alwine Meyer. Gordon W. Rosenthal died on 6 February 1930 at 8 months.